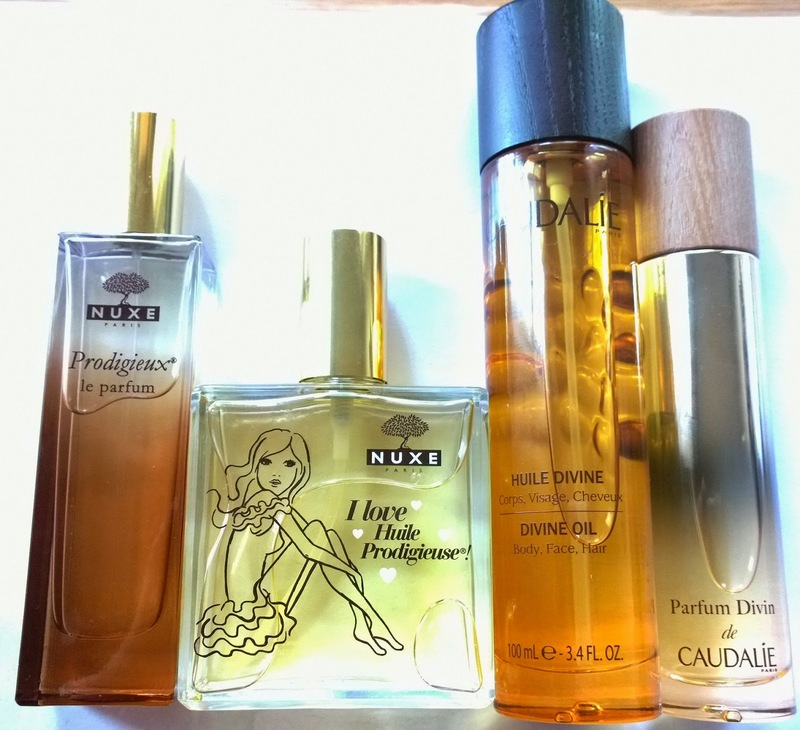 Those two great French skincare competitors, Nuxe and Caudalie, have both brought out perfume versions of their cult body oil products this summer, and I managed to get my hands on both so I could compare and contrast each of them. Nuxe is probably the cult body oil product in the UK, and this summer, the iconic rectangular bottle has been re-issued with a cute limited edition design, which I surprisingly rather like. The perfume bottle is a flat oblong with a bronzed ombre effect over. It looks rather staid in comparison to the limited edition bottle though, I think! The scent is warm, redolent of jasmine and sunshine, with a small hit of coconut. It actually has a rather sunscreen-y scent, instantly transporting you to a beach and the tropical cocktail of your choice. On first spraying, it is intensely heady and rather strong-seeming, but this headiness wears off rather quickly, just leaving a floral-musk skin scent behind, which is rather nuzzly and lovely. It’s very discreet in wear, you’re not going to offend any perfume-phobics in the office in this one. In comparison with the scent of the oil itself, it holds up very well indeed – on first sniff, they’re practically identical – the oil has a more rounded profile, and because of the oil base it’s less sharp-seeming than the parfum, which feels a little thinner than the original formulation. That said the two are to all intents completely indistinguishable from each other. Lasting power for the fragrance, even though it’s a parfum formulation, is around 4-6 hours, but as it wears very close to the skin, sometimes you’ll have to hunt for the scent whilst you’re wearing it. Nuxe Prodigieux le Parfum costs £43 for 50mls. Packaging is, for me, a very important part of any product, and hands down the Caudalie bottles win this particular context. Not only is the circular shape of the oil bottle easier to handle (I struggle with the flat rectangle of the Nuxe, owing to having very small hands, and the bottle is too wide for me to grip properly in use), but the metallic ombre effect on the Parfum Divin bottle is quite, quite lovely. I also like the wooden lids, which add just a little extra touch of luxury and texture to the overall presentation. Divine oil is just a couple of years old, but has spawned a couple of offshoot products already – a body scrub, and Divine Legs, which is a lightly tinted body moisturiser – and the perfume is a natural extension. A lighter, fresher, fragrance than the Nuxe Prodigieux. In comparison, Parfum Divin has an almost cucumber-y ozonic scent, atop a base of blonde woods, cedar and white flowers. I can catch a hint of jasmine here, but it’s far less punchy than in the Nuxe. It dries down to a more woody skin-scent than the Nuxe, but they are both somewhat on the discreet side, and dry down to a gentle inoffensiveness. Whilst less initially heady than the Nuxe fragrance, it’s actually a slightly more sophisticated scent overall, being more redolent of a spa than a sunscreen, but it does still manage to smell almost exactly like the original product, in the same way. Again, the fragrance is a little sharper, and a little fresher than the oil, but this is down to the formulation, as an oil fragrance will always seem a little “fatter” to the nose, than an alcohol-based spray. The lasting power for both fragrances is about the same. Parfum Divin de Caudalie will be available for £39 for 50ml when it launches shortly. There’s a candle version of the fragrance too, which really, really, really needs to join my candle collection, tbh. So, do you need both fragrances? Probably not, to be honest. Both the fragrances are wonderful companions to their respective oils, being respectful recreations of the originals, and they’re both wonderful for layering over the oils for a little extra oomph (the oils will anchor the fragrances to your skin, making them last longer), but which one you prefer will depend on which oil you have a preference for. I can’t actually pick a winner – the Nuxe is a cult product for a reason, it smells great, and is instantly evocative, but, the Caudalie is sophisticated, and (for me) a better bottle. Which one do you prefer? The Fine Print: PR Samples. But I’m ordering a candle, oh yes. No, I am NOT obsessed. Next Post Colour Wow – Root Coverup.